After Salome, Elektra, and even Rosenkavalier, few could have suspected Strauss capable of such wit and fancy. The lightness of the scoring may have begun in necessity – Strauss reworked parts of Ariadne to serve as incidental music to Hofmannstahl's new adaptation of the Moliere Le bourgeois gentilhomme, after all, and dialogue had to be heard over much of it – but Strauss seems to revel in the smaller forces, pulling out one small-scale surprise after another. For once, you don't say lightly scored … considering the forces involved. A neglected gem – one of Strauss' finest scores, in my opinion – the suite at last has attracted the attention of people who want to record it. Reiner for years ran ahead of all competition, even though he left out the Lully Minuet and the Courante in canon. However, the performance excels in wit, verve, and energy. Its only fault (other than omitting two movements) lies in the heaviness of the tuttis. Nevertheless, the violin solo in the "Dance of the Tailors" mazurka and the soloists in the "Fencing Master" not only play the right notes, but they manage to give them character. Reiner catches both the heavy-footedness of M. Jourdaine in the dancing lesson, as well as the grace of the suitor Cleonte in the composite movement that accompanies his entrance. The one disappointment occurs in the satire of the Tafelmusik, where Strauss jokes about Meyerbeer in the opening march (derived from Le Prophete), Wagner's Rhine music (to accompany the course of Rhine salmon), Strauss' own Don Quixote (the guests have switched to the mutton course), and Verdi's "La Donna e mobile" (an entree of larks and thrushes; one of those singing birds is a remarkable operatic artiste with a career cut short). The texture is a bit too heavy and the jokes seem rushed. Overall, however, you could do worse than Reiner. Far and away the best version available. 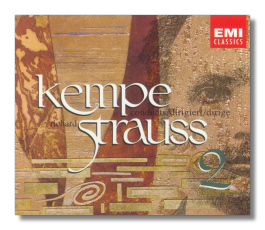 Unlike Reiner, Kempe omits nothing, and the sound retains a chamber-music lightness that allows Strauss' polyphony to shine through. This is apparent even in the waltz which concludes the overture, usually played oompah-pah and completely missing the contrapuntal strands that actually create the beats. In "The Fencing Master," the trombone, trumpet, and piano play up the "Carnival of Venice" loopiness of the virtuoso writing, without coarsening the joke. Kempe brings out the ingenious canon all throughout the "Courante," not only in the introductory violin and cello dialogue. In the "Entrance of Cleonte," Kempe finds a beautiful intimacy, particularly in the opening for strings, that just about breaks your heart. The following quick section dances, cheeky and light on its feet. Even the "Intermezzo," the most conventional section of the suite and the one least likely to impress itself upon a listener, becomes in Kempe's hands a character study of the superficiality of M. Jourdaine's noble "friends." Kempe's performance stresses the ties to Ariadne and to the Moliere play. Järvi and the Stockholm Sinfonietta have very little measure of the wit of this piece or of the skill needed to bring it off. The players float through the work like somnambulists. The ensemble is ragged, subsidiary lines disappear, and everyone seems to have lost their sense of humor. This recording comes to life only once, when the piano realizes that his outlandish arpeggios in the "Fencing Master" sequence are actually jokes, rather than finger exercises – an illusion shared by the trombone and the trumpet. But his bit soon finishes and we return to a rather gray reading. BIS couples this, by the way, with an indifferent oboe concerto from the same forces. The recorded sound has too much treble, but it is acceptable. Orpheus' performance blows hot and cold. The quick opening of the overture scintillates; the waltz conclusion settles into the ordinary. The "Fencing Master" starts out cleanly, but without anyone aware that what they play is more than a bit off-the-wall, while the martial conclusion quickens your pulse. The ensemble is generally razor-sharp, but, curiously, the group often misjudges the true nature of the textures. Further, they usually play rather tentatively, as if afraid the work will shatter, should they commit themselves. As for the "Entrance of Cleonte," for me the heart of the score, I can say only that they play in tune, without the emotional beauty of Reiner and Kempe. On the whole, the reading stresses precision of attack and a superficial "walking-on-eggs" delicacy, rather than genuine refinement. This may be one of the problems of interpretation by committee.